 Combining rare narrative skills and historical detail, Johnson (History/Univ. of Utah) and Wilentz (History/Princeton) recreate the fascinating tale of a false prophet and his misguided followers in New York in the 1820s and '30s. The authors reveal the social, economic, racial, and sexual conditions that give rise to apocalyptic cults and their virile, charismatic leaders. A whole series of evangelical cults appeared in the early decades of the 19th century to serve the poor, the emotionally needy, those excluded from the new prosperity, optimism, tolerance, personal freedom, and rational belief of the mercantile classes. Elijah Pierson started the Retrenchment Society to rescue prostitutes but became deranged himself when he was unable to raise his wife from the dead. 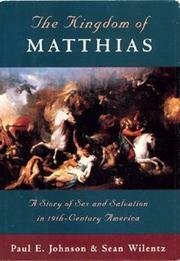 Robert Matthews, later Matthias, an impoverished carpenter who had beaten and abandoned his wife and children, engaged Pierson's interest and used his resources to start his own Kingdom, a communal patriarchy that advocated ``abundant'' food, naked bathing, wife-swapping, and complete obedience. Fully bearded, dressed in bizarre costumes of ruffles, pantaloons, and a magician's cap, the deranged Matthias ``damned'' wives who worked, men who wore spectacles, and most Christians. Inevitably, his anarchic thinking came in conflict with the law, and although he was suspected of poisoning Pierson and stealing his money, Matthias was convicted only of beating his daughter and jailed for 30 days. The lurid trial dominated the new ``penny'' journalism, generating pamphlets and books alerting Christians against fanaticism. But to the slaves, the improvident, and the laboring classes, Matthias and similar cults offered a refuge and inspiration. A black servant, for instance, had her own revelation in 1843 and was reborn as Sojourner Truth, abolitionist ex-slave. A chilling study in social psychology, this volume explores the dark energies behind leaders such as Jim Jones and David Koresh and the needs they exploit.